New book, 128 pages. 200+ photos. This book takes you on a visual journey through a century of innovation. 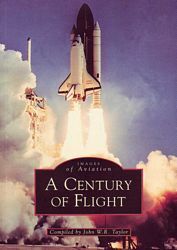 With many rare photos from the early days of aviation, the World Wars, Commercial and record breaking flights, accompanied by detailed commentary, the author covers the landmark moments of the first 100 years. There is currently 2 of this item in stock. This item was added to our catalog on Sunday 05 March, 2006.